Does anyone know what the name of this species is? Representatives were working with John Sheridan against the Shadows and some may have been Rangers even. Here is a link if the picture will not show up. Didn't see anything listed when I checked, doesn't mean much though. There were thousands of hundreds of thousands of systems and near as many races. Doubt a one time backround extra is going to be mentioned. Not all aliens are going to have a name or a background. 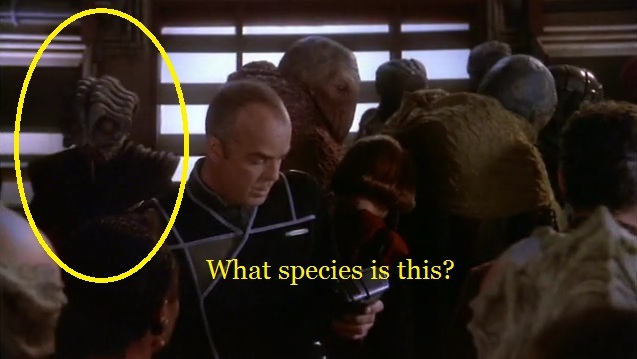 I am pretty sure that species appeared in two episodes. Two were in the War Room and then this one alone. Thanks anyways for the effort guys. I wasn't holding out much hope. There could be any number of small races on the fringe of the LoNAW which aren't actually members; gonna have to chalk this one up to the mysteries of space.